Heat barbecue to medium heat. Remove chicken from marinade; discard marinade. Grill chicken 5 min. ; turn. Add vegetables; grill 5 min. or until chicken is done (170ºF) and vegetables are crisp-tender, turning vegetables occasionally. 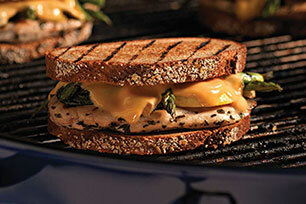 Fill bread slices with chicken, vegetables and Kraft Singles to make 4 sandwiches. Spread outsides of sandwiches with Miracle Whip. Grill 3 to 5 min. on each side or until golden brown on both sides.